As we are shifting into higher dimensions, more and more of us are realizing about our past existences, our true nature as well as receiving glimpses and feelings that we may feel related to Lemuria or Atlantis or Ancient Egypt. Many of us feel strongly about our previous reincarnations as a priest, priestess or as an oracle. Many of us feel our other existences in the parallel universe, other planes. Or at the very least we may experience teleportation, out of body experiences and at least one or more lucid dreams. We are more aware. We feel drawn to certain information in the past. We may even feel related to great leaders of our history and religious deities and those who were later proclaimed as Saints. Many may feel related to such established archetypes as Cleopatra, Joan of Arc, Saint Paul, Mother Theresa just to name but a few. So, what’s this all about? Are we all really gods and goddesses? Are we all just going through cycles of reincarnation through every single person we feel related to? Alas, and perhaps even for the better – not. 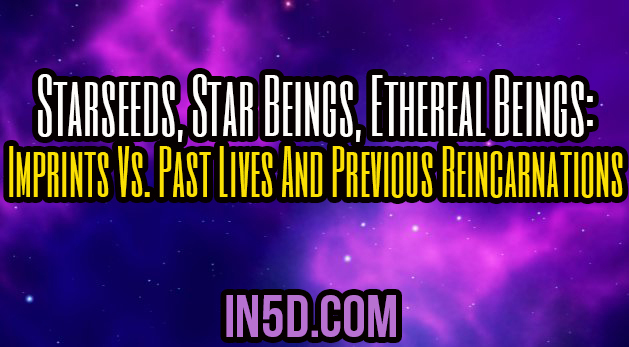 When it comes to recent reincarnations on Earth, we are referring here to Star Beings, Star seeds or Star people, Ethereal and other beings who came here for the very first time; many of us are reincarnating here (for whatever purpose that may be and yes, it is related to the Earth’s ascension in general) we come from different cosmic walks of life so to speak. The Earth to us is a strange and alien planet. In order for us to be able to feel at home, even if temporarily, we went through a stage that is commonly referred to as imprinting. Where imprinting is a reference to a ‘library’ of lives lived, and experienced on Earth. We often refer to them as Akashic records. For those of us on a mission and even if it is only for a short experience of life on Earth, we need a better understanding of what it is like to live here. Many of us have nothing like this at our ‘origin’ or a place we may actually call home. Many of us are not familiar with the inability to control emotions, many of us are not exposed to cheating or arguments. Your author, myself here, for once, struggled a great deal throughout childhood with understanding the phenomena of arguments, and to this day I’ll try to avoid confrontation at all costs. If it happens, my senses are unable to handle it and I believe the right expression is ‘I blow a fuse’… not a pretty picture! Prior to coming to this planet, Earth, you would have had your goals set. It is not that your path is 100% prewritten, as you are not in control of others as well as your human self fully, and in order to craft your path as closely as possible to achieving the goals you set to accomplish you go through imprints. It is not so much about the quantity but the quality and relevant experiences to your set path. You immerse yourself into another person’s life, to such an extent that it is real to you. You are not that person, yet you have fully experienced everything that person went through. As with the first imprints you are still learning, there is a disassociation of sorts. For example, you feel exactly what that person feels, but upon exiting the imprinting process your view may be very different to that of the owner of the ‘imprint’. The goal is to absorb the human reality as much as necessary to understand every possible factor that may influence your decision and direction when you are human. Depending on your mission, you may go through imprints of sorceresses, oracles, priests and priestesses, in which case you are likely to share the wisdom from the stars in this reincarnation. You may go through imprints of great leaders, in which case you are absorbing the qualities which will help you to lead others. You may go through imprints of simple peasants in order to connect with the Earth’s energy itself better, so that in this reincarnation you can facilitate the oneness with the Earth as the planet. You may go through an unlimited number of reincarnations should your mission require it, and that will be helped for you with those who volunteered to do these kinds of jobs. Many of you would undertake such a role of guides to help others to go through imprinting and then reincarnate on Earth, then record the observations: What worked? What didn’t? And further improve the next reincarnation processes. All at this stage to raise the Earth’s consciousness and add humanity to the cosmic evolution on a grandeur scale. So, how do you know what is an imprint and what is your real experience? Because there are some of us who actually have had a reincarnation on Earth before (but not many!) We don’t. As the way imprinting works, it might as well be our own life, or our own experience. Of course, if you are to say that you were definitely a high priest in your previous life and you are currently helping the others with spiritual guidance, I’d reassure you that is an imprint. You get the idea? People who give you a reading, are almost unable to separate what’s yours and what’s not. And you can’t be harsh on them. Remember the history, witches and aliens are never appreciated, are prosecuted and exterminated where possible and so on. And from that perspective all of us are not carrying any marks that are visible to the others (okay, yes myself and many others can see some of your marks with our other senses that are NOT visible to the human eye and therefore cannot be proven!). We are as human, in this our reincarnation as we possibly can be. And in that sense, we are genuinely interested in the ascension of the Earth and humans in the most genuine way with the greater good in mind for everyone participating. What do I do with such knowledge? That, your inner knowledge alone, will give you heaps of insights into your current life’s mission and goals!